Seven young writers – three from the Australian Capital Territory, two from New South Wales, one from Queensland and one from South Australia – have won various prizes in The Good Oil 2017 Young Writers’ Award. The winning entries across three age categories were announced yesterday, August 15, on the website of the Good Samaritan Sisters and via Twitter. Ashleigh Green, Evan Ellis and Alice Priest, all published writers who have written for The Good Oil, formed the judging panel. They based their decisions on the entries which best explored the theme “Who is my neighbour?” in their chosen writing style. In particular, the judges were looking for writing that was topical, engaging, accessible, creative, original, and well written. Victoria McGlynn, age 25, from Queensland, was awarded first place ($500) in the post-school (18 to 35 years of age) category for her article “All things at once”. “This is a powerful and well-constructed article which authentically engages the reader, inviting us into the very personal experience of a young person grappling with the news of a parent’s terminal illness,” said the judges. Second place in the post-school category was awarded jointly to Beth Doherty, age 34, from the ACT, and Naomi Currie, age 21, from South Australia. Beth and Naomi will each receive $300. Of Beth’s article, “Of friends, faith and fellowship”, the judges said: “Through first person reflective writing, this article addresses the question – Who is my neighbour? – in a multicultural, interfaith Australian landscape, and highlights the mutuality and richness of ‘neighbour’ experiences. The judges described Naomi’s opinion article, “Snails make good neighbours”, as a “thought-provoking and well-researched opinion article [that] engages with the question – Who is my neighbour? – in an original and creative way”. “The author conveys the complexity and the challenge of being a neighbour in today’s world. Highlighting the sacrificial aspect of being a neighbour was insightful,” they said. Giving careful consideration to the criteria and guidelines for the award, the judges did not award first, second or third place in the secondary student (Years 10 to 12) category. But they did award a highly commended to 17-year-old Eoin Garton from St Francis Xavier College, Florey, in the ACT, for “Neighbours: The gateway to the human experience”. Eoin will receive $100. “This article explores the experience of a young person growing up with a sibling who has ‘an extremely rare, severe disability that has no diagnosis’,” said the judges. First place ($500) in the secondary student (Years 7 to 9) category was awarded to Abrafi Owusu-Mensah, age 12, from Good Samaritan Catholic College, Hinchinbrook, in NSW, for “Grey”. “This artfully-composed article explores the question – Who is my neighbour? – through the lens of a grandchild living in Australia and grappling with the familial legacy of apartheid,” said the judges. Georgia Rice, age 15, from St Francis Xavier College, Florey, in the ACT, was awarded second place ($300) for “To testify”. “This is a strong creative writing piece which demonstrates a mature understanding of compassion,” said the judges. Grace Hawkes, age 13, from Our Lady of Mercy College, Burraneer, in NSW, was awarded third place ($200) for “My neighbour, the good Samaritan”. “This is a highly engaging first person reflective article that is authentic, fresh and lively,” said the judges. All three winning articles in the post-school category have been published in today’s edition of The Good Oil, the e-magazine of the Good Samaritan Sisters, while winning articles in the other two categories will be published in forthcoming editions. For Sister Bernardina Sontrop, a member of the Good Samaritan Sisters’ leadership council and one of the award’s organisers, The Good Oil 2017 Young Writers’ Award has been “a very worthwhile project”. “I was surprised at the different insights and thought-provoking reflections produced in the various age groups,” she said. “The winning entries certainly achieved our hopes that the award would produce writing that would explore what the central message of the parable of the Good Samaritan means to young people today. Bernardina acknowledged the Sisters of the Good Samaritan and Good Samaritan Education for their generous support and sponsorship of the award. She said it had not been decided if the award would continue next year. The Good Oil Young Writers’ Award is an initiative of the Sisters of the Good Samaritan in 2017 to celebrate the 160th anniversary of their foundation. The award seeks to encourage and support the development of young writers interested in exploring ideas, issues and stories about people and happenings from a contemporary Christian perspective. 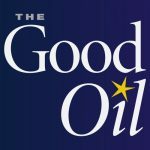 To be among the first to hear if The Good Oil Young Writers’ Award will be held in 2018, subscribe here or follow us on Twitter @TheGoodOil.